The older two boys have been sharing cold germs generously over the past week, so it is no surprise that Colten eventually started coughing, sneezing and sniffling. 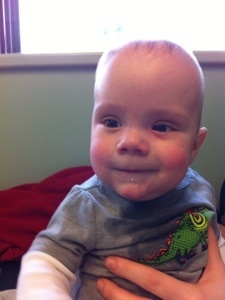 We were at the doctor today to followup on Parker’s ear infections, Max’s wheezing, and to let the doctor take a look at the newly symptomatic Colten (and to have his “creaking” checked out – maybe another story for another day?!). Thankfully, our wonderful nanny, Chelsea, who is with us three days a week, was available to help trek the boys with me! The older two boys checked out fine. 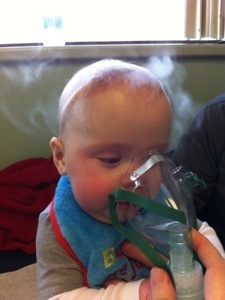 But apparently, as my sister Sarah put it, Colten “must have been bored.” The doctors heard quite a bit of noise rattling in his lungs and gave him a breathing treatment there in the office. 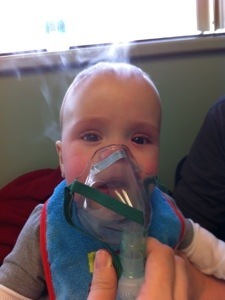 He sounded a little better afterwards and was prescribed breathing treatments at home four times per day as needed. He’s just trying to keep us on our toes. Make sure we don’t forget about him. Like we could forget about this cutie..
“Never a dull moment”, my mother would have said. 🙂 Be well……..all of you!!! And what about Parker’s ears and the wheezing Max? Hope all 3 are on the mend. Hope Mom and Dad are taking all this in stride. Sounds like humor is your best med.